This kitchen design is a strong, solid classic look with modern accents. The combination of stone gray matt finish doors with cool Odessa oak accents creates a town meets country look. Attention to detail is reflected in the classic cut and retro bow pull handles combined with the cool, milky Kashmir granite worktop. 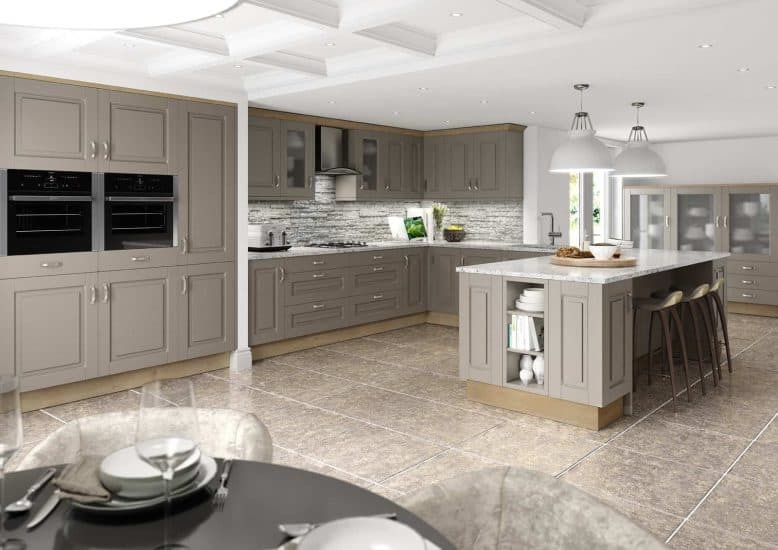 The carved ridges on each of the doors give this fitted kitchen a unique character and style. This design is perfect for either a traditional or contemporary look and can easily be moulded by accessories and colours. We understand doing any sort of home renovations can be daunting, especially if you’re starting from scratch. That’s why we have an efficient and friendly interior design team here in the Starplan stores to help answer any questions, work with any ideas you may have and to ensure we keep to your budget to alleviate any financial pressure. We want you to enjoy creating one of the most important rooms in the house, not dread it! 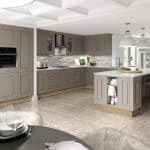 So with fitted kitchen showrooms in Dungannon, Bangor, Newtownabbey, Coleraine, Portadown and Belfast, it’s never been easier to find exactly what you’re looking for.